The fourth season of Fringe began with two major questions: “Where are we?” And, “Where’s Peter?” But while the show has been distracting us—and sometimes even dividing us—with these mysteries, it’s also been developing a motif. The story of Fringe is largely the story of Walter Bishop, a cocky mad scientist who discovered an alternate universe, found a way to penetrate the barrier between our universe and theirs, and then was so shaken by what happened next—death, destruction, “fringe events”—that he hobbled his own brain, and descended into madness, before being pulled back into semi-sanity by his emotional attachment to a man who resembles his son. 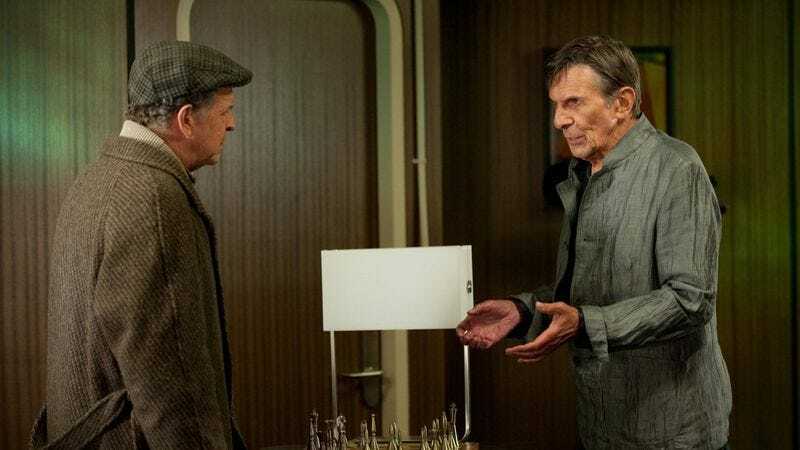 And week after week in season four, Fringe has introduced us to a series of Walter-types: men who commit terrible crimes in the cause of curing disease, or in order to help people find love, or just because they themselves never had the strong familial bond that Walter enjoys. So who else could the season’s big villain be but William Bell, Walter’s old partner in scientific crime, and a man with the arrogance to torch the world in order to save it? The lead in question is Jessica Holt, who it does have more of a role to play in this two-part season finale than merely “Nanite Victim #3.” Turns out she’s working for Bell, and being followed by September, whom Jessica traps by luring him to the stasis runes on her floor, then having that section of floor cut out and transported to the A1 warehouse, where Jessica confronts Olivia and Peter. The scenes with Jessica are a prime example of what this episode does poorly and does well. There’s a bit too much pulp villainy in the way Jessica smirks at the trapped Observer and says, “This is a future he didn’t foresee.” But then we get September plucking Jessica’s bullets out of mid-air, and Jessica pulling out a more powerful gun with bullets too fast for September to catch, and then Olivia telekinetically flinging some of Jessica’s bullets back at her. There’s nothing about any of that that’s not exciting. Nor is there anything not-exciting about Peter’s attempt to question the dead Jessica, by attaching her to electrodes, injecting her “right in the thinker,” and calling in Nina with her big bolt-gun to get the corpse properly wired. Once Jessica’s juiced, her eyes jerk about spastically and she speaks with two voices at once, spilling memories from her childhood—“My bicycle is blue and it has a little chimey bell!”—while also tipping off Peter, Olivia and Nina that William and Walter are on a boat. A quick check with Broyles at Fringe Division confirms some atmospheric disturbances at sea, leading all concerned to conclude that Bell is still planning to collapse the two universes, and that he’s relying on the Cortexiphan-saturated Olivia to be his power source. (Olivia frying Jessica’s corpse with her mind is another tip-off.) Last season, Peter was the battery to power a machine that would destroy one world. This season, Olivia’s very existence threatens both. Again, this turn of events brings out the best and worst of “Brave New World, Part 2.” On the downside, we have Nina explaining to Olivia why Bell and Bishop picked her as a child, and how, “At heart, you’re still the same girl I knew.” Then, when they’re all choppering out to Bell’s Manimal Ark, it’s Nina who leads Olivia and Peter by the hand to an explanation for why Peter can see the ship and no one else can. (It’s because he’s vibrating at its frequency.) And it’s Nina who urges Olivia to take Peter’s hand and jump toward the ghost-boat, because, “You’ve had the power all along.” (Ugh.) On the upside, we get Peter helping Olivia deal with the way Bell has experimented on her for most of her life, telling her that unlike when she was a kid, now she’s not alone. And we get the lovely image of Olivia and Peter, hand-in-hand, jumping toward the water and miraculously landing on the deck of a ship. This episode raises a lot of Fringe-friendly questions about the line between technology and magic, and scientific knowledge and divinity. Jessica shrugs off September’s bullet-catching trick, saying it’s “just tech” that allows the Observers to move super-fast. She also suggests that no one should feel bad when she slips a bullet past September’s defenses, because he feels no emotion, and perhaps no pain. But is that really the case? Or is just that the Observers are so advanced that their version of emotion and pain is imperceptible to us? Meanwhile, on Bell’s ship, he and Walter are having just those kind of conversations about “fate” (which scientists know as “nothing more than the convergence of a set of probabilities into one potential outcome”) and “providence.” It’s not that William suddenly believes in God; it’s more that he believe he’s become one, now that he has the capability of creating a new world. Bell quotes Yeats—another man of vision—and appeals to Walter’s scientific curiosity, to urge his old friend to join him on this amazing new adventure. I could knock the Bell scenes for being over-explanatory, and for ultimately being all about him building a space for a race of humanoid beasties to roam free, which is a little goofy, I admit. But while I know some of you hate the manimals, I do not. I think they’re cool. Maybe not “what the entire season has been building to” cool, but cool nonetheless. Also, I enjoyed Bell’s enthusiasm, as he’s saying to Walter, “You were right right right!” and as he greets the arrival of Peter and Olivia by saying, “Y’know, I was not planning on having any humans” (while still magnanimously offering them the chance to be his Adam & Eve). Like so many Fringe antagonists, Bell is so appealingly sure of himself, and thus sympathetic in his way. What ultimately elevates “Brave New World, Part 2” beyond its more forced or clunkily functional moments is the way the Bell storyline resolves. Walter proves more cruelly logical and scientific than his old friend had figured. If Olivia’s powering this armageddon, then there’s only one solution: Walter shoots and kills Olivia. Then, after Bell rings his namesake and vibrates his way into the fifth season, Walter uses what he learned from last episode’s lemon-brain cake, and creates an exit wound for Olivia so that he can extract the bullet and her Cortexiphan powers can revive her. Better living through chemistry. The episode then tumbles into that overabundance of happy endings I mentioned earlier, whereas it might have been better served by something simpler and more elegant. But the real ending to “Brave New World” is more beguiling. Back at the lab, Walter gets a visit from September, warning that trouble’s a-brewing. Earlier in the episode, Olivia holds a bleeding September and mentions that he looks the way he looked when he visited her and told her that she was going to die, to which September says that this hasn’t happened to him yet. Now here’s September again, un-shot, talking to Walter. From whence in time does this Observer come? And what colossal mistake will our top scientists make in trying to prevent the Observers’ future from corrupting our own? Oh, Astrid’s fine, by the way. Next season: General Broyles! Possibly Nina as Fringe Divison’s science advisor! And (presumably) the beginning of the end for our world as we know it.